Why does SongKong not match this song to the right song ? SongKong is a release based tagger, this means that first of all it always tries to match songs to a complete release rather than an individual song to an individual track on a release. Release based tagging is much more sophisticated then track based matching. But if you only have the odd song instead of complete releases such as albums and E.P' this is not possible. So unless Only allow match if all songs in folder match to one album and Only allow match if all songs in album were matched are both enabled SongKong then attempts to match the remaining songs one at a time. The primary way of doing this is matching by the Acoustid but sometimes a single Acoustid can match multiple recordings, so we use additional metadata to help decide on the best recording. But this doesn't always help so in SongKong 3.2 we have added two new options. If you know the metadata is incorrect you can enable this option so that only acoustids are considered then SongKong will use the recording that has been matched to that acoustid by the most people, this is usually the correct choice. 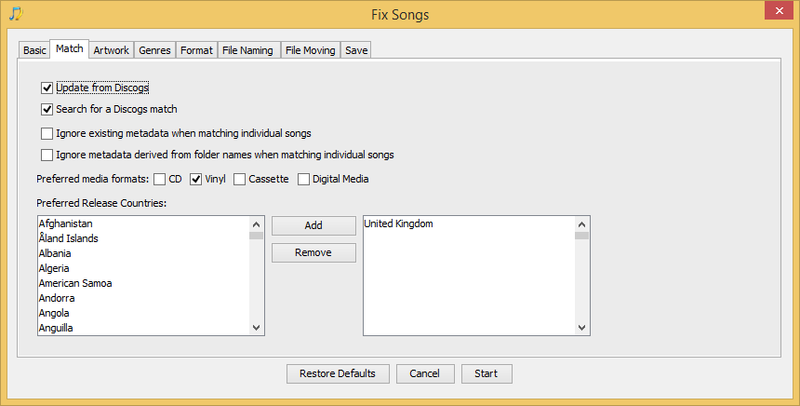 If the song has no song title SongKong tries to derive the song title from the filename but if you know the filename does not represent the song title it can be ignored by enabling this option.